FAIP pressure washer machines are amongst the most sought after pressure washers on the market today. Running in most cases on electric power the pressure washers used to perform a wide range of jobs such as cars, decks, boats, driveways, side walks, gutters and fences amongst many others. FAIP is essentially a household name all across America particularly because most of the models under this manufacturer are affordable selling as little as $150.00 on Amazon. This is in contrast to some of the highly priced pressure washer models such as those from NorthStar, Simpson and Campbell Hausfeld amongst many others. One of the most suitable and recommended marketplace to compare FAIP pressure washer prices and read some informative reviews is Amazon . 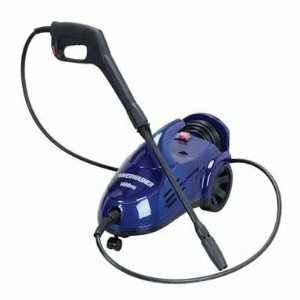 The following is a list with reviews of specific Faip powerwasher models available for purchase across the internet today. 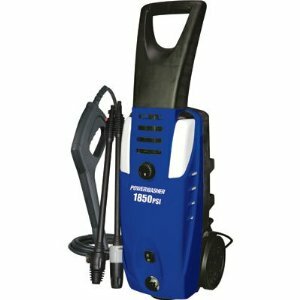 Selling for about $150.00 online the FAIP PWS1800-U is considered a heavy duty pressure washer which releases as much as 1800 psi of pressure. It has 1.6 GPM flow. In as much as this pressure washer is frequently advertised and listed in many online stores as a heavy duty washer, make no mistake this washer is suitable for home use. In other words it does heavy jobs around the home and must not be confused with a the industrail heavy duty pressure washers such as the Simpson King Brute Industrial gas washer or NorthStar's Professional Series Pressure Washer 3000 PSI. By heavy industrial standards this washer is weak. In addition it have a huge disadvantage of running on electric power. In many cases washers running on electric power. This entails an electric cord which can be both limiting and dangerous around many industrial site. This leaves this washer to be a suitable candidate for demanding cleaning projects around your home. The electric cable is 35ft long and is GFCI protected. It can be plugged into any home electricity outlet. This pressure washer has a variable spray wand which can be adjusted according to your projects from a direct pencil like spray to a wide spray fan spray. 3. Spray gun leak experienced by some users. This pressure washer from FAIP can be a good buy. However ensure that you read all the reviews in detail both positive and negative/poor before arriving and final decision. We give this washer 3 out of 5 stars. This model of the FAIP pressure washer machine series has 1400 psi of pressure that is released at 1.5 GPM. It has a rear entry spray gun which many pressure washer users highly recommend. The fact that water enters the gun through the rear makes it easier to handle the wand. This enters greater maneuverability around a job. This pressure washer runs on electric power and has a power cord 35ft long. Users of this pressure washer appreciate its light weight design which also makes it easy to carry around and store. It has a soap.detergent dispenser bottle which allows you to add some detergents when doing your projects. It is a recommended washer for the cleaning of cars, driveway, patio, garage and ATV. The price for this unit is great at $100.00. It will serve the purpose for small around the home jobs and should not be counted for a heavy duty pressure washer. This washer is arguably in the league of a similar small sized portable washer by Campbell Hausfeld. We recommend this washer for light users. See price and reviews . Running on a 13Amp electric motor this washer releases 1850 psi of pressure. It has a facility for detergent use with on-board detergent tanks. The washer comes with a 35ft power cord that allow you to maneuver around the home from one place to the other carrying out your cleaning projects. To save the pump and motor for early wear and tear the washer has an integrated auto stop system that shuts them on and off when spray gun trigger is released. The manufacturers claim that this also saves water and energy. This is one of those pressure washers that are easy and straight forward to use. Combined with other accessories such as the rotating scrubber this machine will do a very nice job around the home. On average the machine sells for just under $300.00 and is more advanced than the two reviewed above from FAIP. Once again this machine is likely to do you good in the home than any more demanding site. 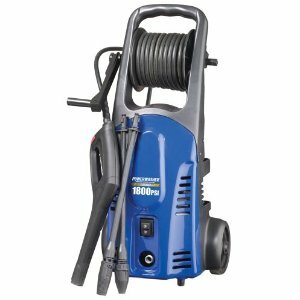 Pressure Washer Accessories- Accessories for pressures are disigned to make your cleaning projects easier to accomplish. These typically include hoses, detergents,rotary brushes and so on.